¹ Starts the night before. "Were the House Still Standing"
New Grandchild from Rabbi's Oldest Daughter who gave birth to a Healthy Boy on Lag B'aomer (the very same day as the celebration for their oldest son's daughter Hadassah Miryam). Mazel Tov to the Families! The Ordering Lists for kosher Passover 5779 (2019) goods are now available from Scoop & Save in Fredericton, NB. Please view the three PDF files here, or visit our documents page. Instructions are included in the files. The Sale of Chametz Form for Passover 5779 (2019) is available on our documents page. Instructions are included in the form, and it has to be received by the Rabbi, no later than 11 pm on Thursday, 18 April 2019. Invalid links have been removed from the external sites' lists of photographs, from our photo page. 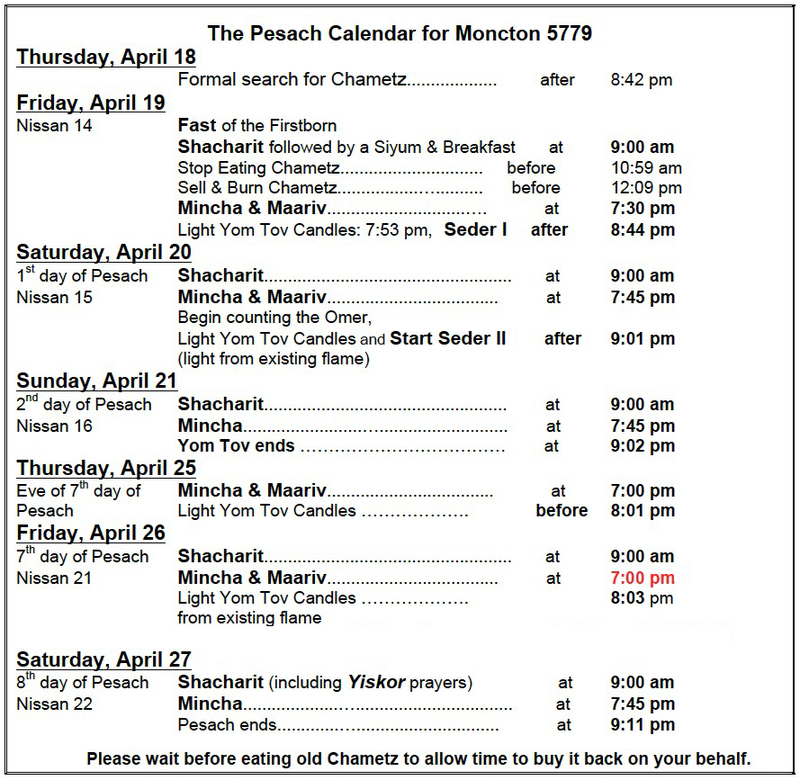 The Pesach 5779 Bulletin is now available. Please view the PDF file here. The Pesach 5773 Bulletin is now available. Please view the PDF file here. Please make an effort to come. A minyan is most desirable. Reception following at the Synagogue. Please refer to chart on the wall in the foyer. 16 September 2015, fast begins at 5:28 a.m. and ends at 8:00 p.m.
Breakfast following Shacharit at A. Jochelman. Fast day postponed to Sunday. Bar Mitzvah of Joshua Michael Haller. Mazeltov! in honour of the yahrzeit of Steve Gergely (z"l). When the Holy Temple stood in Jerusalem, each Jew contributed an annual half-shekel to the Temple. The 1st of Adar marked the beginning of the collection of the shekalim. In commemoration, the Torah reading of the Shabbat that falls on or before Adar I is supplemented with the verses (Exodus 30:11-16) that relate G-d's commandment to Moses regarding the first giving of the half-shekel. This being the Shabbat before Purim, on which we celebrate the foiling of Haman the Amalekite's plot to destroy the Jewish people, the weekly Parshah is supplemented with the Zachor reading (Deuteronomy 25:17-19) in which we are commanded to remember the evil of Amalek and to eradicate it from the face of the earth. The Torah reading of Parah (Numbers 19) is added to the weekly reading. Parah details the laws of the "Red Heifer" and the process by which a person rendered ritually impure by contact with a dead body was purified. (When the Holy Temple stood in Jerusalem, every Jew had to be in a state of ritual purity in time for the bringing of the Passover offering in the Temple. Today, though we're unable to fulfill the Temple-related rituals in practice, we fulfill them spiritually by studying their laws in the Torah. Thus, we study and read the section of Parah in preparation for the upcoming festival of Passover.) "Parshat Hachodesh" is the fourth of four special readings added during or immediately before the month of Adar (the other three being "Shekalim", "Zachor" and "Parah"). Elul Observances: As the last month of the Jewish year, Elul is traditionaly a time of introspection and stocktaking -- a time to review one's deeds and spiritual progress over the past year and prepare for the upcoming "Days of Awe" of Rosh HaShanah and Yom Kippur. As the month of Divine Mercy and Forgiveness, it is a most opportune time for teshuvah ("return" to G-d), prayer, charity, and increased Ahavat Yisrael (love for a fellow Jew) in the quest for self-improvement and coming closer to G-d.
Selichot: The series of Selichot ("supplication") prayers recited in preparation for the "Days of Awe" of Rosh Hashanah and Yom Kippur begin this Saturday night, after midnight (after the Ashkenazic custom; the Sephardic community begins on the 1st of Elul). On subsequent days, the custom is to recite the Selichot in the early morning hours, before the morning prayers, each morning up to and including Elul 29, the eve of Rosh Hashanah. Kiddush Levanah: Once a month, as the moon waxes in the sky, we recite a special blessing called Kiddush Levanah, "the sanctification of the moon," praising the Creator for His wondrous work we call astronomy. Kiddush Levanah is recited after nightfall, usually on Saturday night. The blessing is concluded with songs and dancing, because our nation is likened to the moon�as it waxes and wanes, so have we throughout history. When we bless the moon, we renew our trust that very soon, the light of G-d's presence will fill all the earth and our people will be redeemed from exile. Today is Tu B'Shevat ("the 15th of Shevat") which marks the beginning of a "New Year for Trees." This is the season in which the earliest-blooming trees in the Land of Israel emerge from their winter sleep and begin a new fruit-bearing cycle. Today is Rosh Chodesh ("Head of the Month") for the month of Tevet (when a month has 30 days, both the last day of the month and the first day of the following month serve as the following month's Rosh Chodesh). Special portions are added to the daily prayers: Hallel (Psalms 113-118) is recited — in its "partial" form — following the Shacharit morning prayer, and the Yaaleh V'yavo prayer is added to the Amidah and to Grace After Meals; the additional Musaf prayer is said (when Rosh Chodesh is Shabbat, special additions are made to the Shabbat Musaf). Tachnun (confession of sins) and similar prayers are omitted. This week's Torah reading contains the "song at the sea" sung by the Children of Israel upon their deliverance from the Egyptians, when the Red Sea split to allow them to pass and then drowned their pursuers. Hence this Shabbat is designated as Shabbat Shirah, "Shabbat of song." When the Holy Temple stood in Jerusalem, and all Jews would come there for the three annual "pilgrimage festivals" (Passover, Shavuot and Sukkot), Sivan 12 was the last of the seven days allotted for the offerings brought in conjunction with the Shavuot pilgrimage (unlike the festivals of Passover and Sukkot, which have seven biblically mandated days, Shavuot consists only of one day; hence the additional six days of tashlumin or "fulfillment"). Three Weeks Laws and Customs: During the Three Weeks, from 17th of Tammuz to the 9th of Av, we commemorate the conquest of Jerusalem, the destruction of the Holy Temple and the dispersion of the Jewish people. Because of the holiness of Shabbat, the Fast of the Ninth of Av mourning destruction of the Temple and the exile of Israel (see "Today in Jewish History") is postponed to after Shabbat. The fast begins this evening at sunset, and continues through tomorrow, Av 10, till nightfall. Some of the fast's mourning practices--such as refraining from Torah study other than texts related to the events and nature of the fast day--are observed beginning from midday today. Finish eating by sunset. After nightfall say, "Blessed is He who distinguishes between the holy and the mundane." 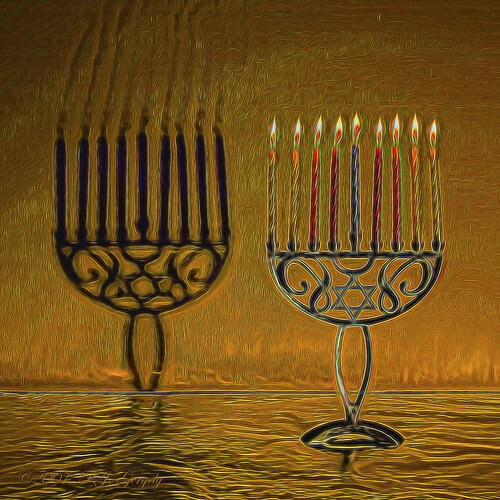 No Havdalah tonight, but light a candle and recite the fire blessing. Havdalah is recited after the fast (omitting the candle and incense blessings). Beginning on Nissan 1, and continuing through Nissan 13, we recite the verses (from Numbers ch. 7) describing the offerings made by the "princes" (nesi'im) of the 12 tribes of Israel (see "Mishkan inaugurated"). In regular years, the 15th of Adar is Shushan Purim, the festival that celebrates -- in Jerusalem and other ancient walled cities -- the salvation of the Jewish people from Haman's evil decree in the year 3405 from creation (356 BCE). In a leap year -- which has two Adars -- Shushan Purim is observed in Adar II, and the 15th of Adar I is designated as Shushan Purim Katan, the "Minor Shushan Purim." The 10-day period beginning on Rosh Hashanah and ending on Yom Kippur is known as the "Ten Days of Repentance"; this is the period, say the sages, of which the prophet speaks when he proclaims (Isaiah 55:6) "Seek G-d when He is to be found; call on Him when He is near." It is thus a most auspicious time to rectify the failings and missed opportunities of the past and positively influence the coming year. Psalm 130 and other special inserts and additions are included in our daily prayers during these days. 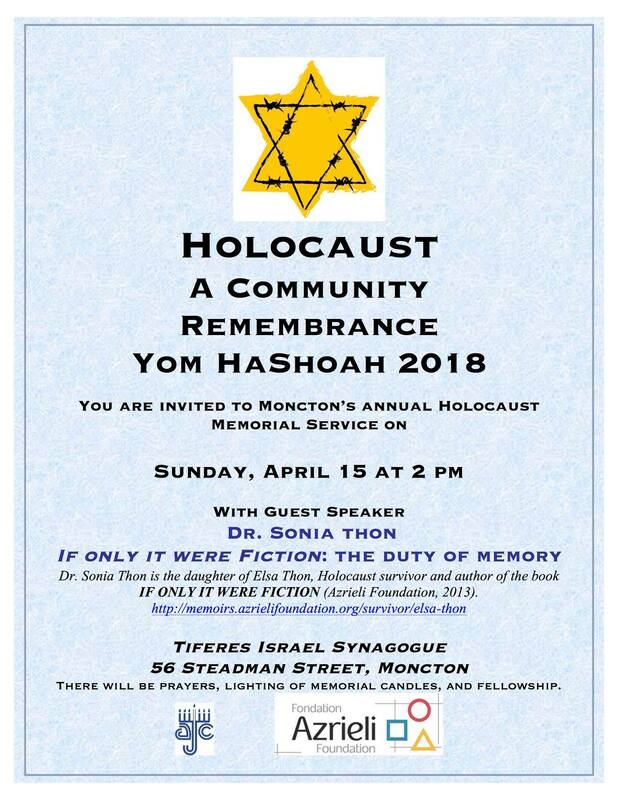 Please visit chabad.org for additional information about this Shabbat. Fast of Gedaliah: Sept.12, begins at 4:55 a.m., ends at 8:33 p.m. The AGM Agenda and the proposed Slate of Officers for 2018 have been sent to congregants via email. Members in arrears will not be able to vote at congregational meetings. Bring and Buy "Get together"
"Were The House Still Standing""
Please join our special guest Dr. Robert Katz for a presentation and discussion of his film "Were the House Still Standing". This film is part of a multi-media presentation created by Dr.Katz for the Holocaust and Human Rights Centre of Maine. It weaves together the testimony of sixteen Holocaust survivors and liberators, using video, large-format photography, audio, and text to ensure that their memories will endure and be shared with future generations. Dr. Robert Katz, Professor of Art, University of Maine, Augusta is on the Board of Directors and is Past-President of the Holocaust and Human Rights Center of Maine. "Moving slowly from the depiction of bucolic stillness, and only gradually to the world of human suffering and horror, Were the House Still Standing is a remarkable contribution to the history of documentary film about the Holocaust". — Professor Henry Schvey, Department of Drama and Comparative Literature, Washington University, St. Louis. Please view the PDF file for more information. Four years of previous bulletins are retained online. Please see the Documents page for availability. Older bulletins may be obtained by contacting the Synagogue.